or to ski with you again: "Let's ski" Bill in the powder on a good day. 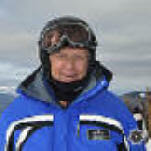 Bill Jones' ski-teaching background: Bill has been skiing over 60 years and was certified in 1997 at the full professional level (level 3) by the Professional Ski Instructors of America (Registration #110478). In Colorado Bill began teaching skiing in 1983, and has been on the staffs of Loveland, Keystone, Copper Mountain, Vail/Beaver-Creek/Arrowhead, Breckenridge, and Arapahoe Basin Ski Schools. Earlier, he taught in and was chairman of a volunteer ski teaching program for local kids at Badger Pass in Yosemite National Park, California. He is currently sanctioned to teach at the Vail Resorts-managed areas of Keystone, Vail/Beaver-Creek/Arrowhead, Breckenridge, Arapahoe Basin, and Heavenly Valley, Kirkwood, and Northstar ski areas of California and Canyons/Park City of Utah, plus others. (see details). He teaches alpine skiing at beginner through advanced levels, older children and up, and both genders. He can help you learn technique for powder skiing, beginning racing, and learning to ski moguls (bumps). He has, however, backed off from teaching on the steepest and deepest bumps and icy race courses. Neither does he teach cross-country or telemark skiing, snowboarding, or in the terrain parks. His language is English, with a very poor smattering of Spanish. Training, PSIA Membership: In recent years he has taken educational clinics provided by Professional Ski Instructors of America on Teaching Women, Bumps, Rocky Mountain Academy, Fall Workshop, Mountain Experience, Mountain Challenge, and Powder Experience (list of clinics Bill has taken)--as well as many sessions in preparing for the passing of Alpine Certification Levels 1, 2, and and 3 and sessions offered at his ski areas. Bill has almost certainly taken far more ski lessons than any of his students ever will, adding many training days each year to his background. 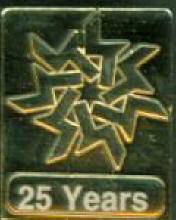 In this way he remains current on advances in the sport's technique and equipment as well as educational methods. The sessions he attends are led by top-level alpine teachers and coaches, including former and current members of the nationally sanctioned Alpine Demonstration Team and national and international level alpine ski racers and coaches. Although beginning skiers are not yet ready for these higher performance levels, as a teacher Bill feels that training at these levels has helped him understand the importance of teaching with a progression of maneuvers that at the outset are consistent with ones eventually to be utilized. Thus learners build on what they already know as they climb the skill ladder rather than being subjected to radical new moves. 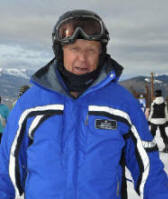 Some Skiing Biography: Bill first went skiing as a teen-ager, but really began skiing as a young adult. Back then in 1959 he was a park ranger at Olympic National Park in the state of Washington, where a small rope-tow ski hill operated. 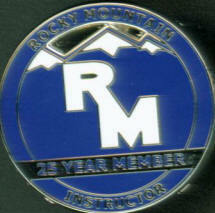 A fellow ranger had been a ski instructor, and helped Bill advance his skiing so he could assist in slope patrol duties. Later Bill was transferred to Yosemite National Park in California as a park naturalist (in time becoming Chief Park Naturalist) and continued skiing there, at Badger Pass. He joined the National Ski Patrol and became a Senior Patrolman. He also worked in and directed the "Wednesday Afternoon Ski School", a group of park parents who taught the local school children one afternoon a week. (Students paid for the program: for the bus ride, equipment, lift ticket, and lesson; the cost was $1!) For Bill and the other parent-teachers in the program, however, a major opportunity was to attend the clinics given by the regular Badger Pass Ski School for their professional instructors, which then included several Austrian, French, Canadian, and Australian instructors, giving diversity to the learning. And so Bill's ski education continued under the guidance of Ski School Director Nic Fiore (who in 1998 at the age of 77 was honored for his 50 years of ski teaching, and, later, at 80+ years was still at the helm!). A stint in organized skiing occurred while Bill was President of the Yosemite Winter Club. Bill got active at Yosemite, too, in backcountry skiing, and made numerous overnight winter ski trips into the park wilderness areas, climbing Mounts Hoffman and the slopes of Mount Dana and others on skis, and taking snow surveys to measure water content in order to predict streamflows for downstream agricultural and municipal water supplies. His most ambitious undertaking was a 5 day ski-mountaineering trip with other rangers across the Sierra Nevada from Mammoth Mountain back to the Sierra west side, snow-camping on the way. Bill en route across the Sierra Nevada. Photo by Bob Barbee. Bill has an active skiing family. To meet them, go to Bill's family album. Bill's grandson Riley, as of late 2016, 3rd nationally in giant slalom racing for his age (29th in the world). He is 5th nationally in slalom racing for his age (46th in the world). The point of this biography is that Bill has seen a broad spectrum of the ski world; he has been exposed to skiing in many of its varied forms and he has seen many changes in equipment, technique, and style. If you have been skiing for many years, for instance, he will recognize "where you are coming from". He'll see that marvelous stem-christie from the old days, for instance, or that strong up-unweighting move we all learned to do back then; and can discuss with you options to either improve what you already have or to retool your technique to take full advantage of modern method and equipment advances. But if you are just beginning to climb the ladder of ski skills, Bill will have a full "bag of tricks" from which to draw exercises and drills to aid your progress. Student limits: Often times a student will confide at the start of a session a list of body parts that are off-limits for use. Sometimes there are even dates of hospital admissions. (Once, an older gent said he could not use one of his knees much any more; so Bill taught him to do his turns on the inside ski one way and on the outside ski the other, using his good knee while saving the not-so-good one. The gent was amazed and grateful--now he could go skiing with his younger lady friend!) Bill has taught enough students over a long enough time span to understand how each of us has limitations and opportunities imposed by our body styles, conditioning, past athletic experiences, history of injury, and willingness to accept risk; he can help you orient yourself to these realities while developing and then pursuing your overall skiing goals. But Bill has also learned modern skiing and thoroughly believes it to be the best, and he has had success in teaching it to all ages. Although Bill has ideas about physical limitations, he is not sanctioned as an instructor of handicapped skiers; he can help you find one if you wish. So, Bill's approach is to provide coaching to enhance skiing efficiency and versatility leading to more fun on the slopes. Learning at all levels is done in graduated ways, and each new maneuver builds on earlier accomplishments. When new technique is taught, for instance, older familiar terrain is used; when new terrain is introduced, older familiar technique that has already been mastered is used. 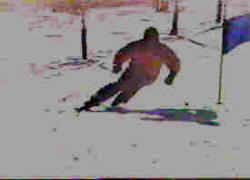 Sometimes, new terrain is tried out to see if a student is ready for it; if not, it's back to more comfortable slopes. Skiers generally do not learn new things when they feel threatened (or "over-terrained", as one coach put it). Yet students are encouraged to be more assertive, and situations are set up through exercises and progressions to help the students become so, because managed speed and acceleration are necessary in many skiing situations: skiing is not a passive sport. A four-letter word may express the best focus in skiing: M-O-V-E, for we tell the skis what we want them to do by repositioning our body parts to relocate the skis' orientation in space as well as the forces on them. We should not move beyond our comfort zone as we learn to ski, but to advance we must crowd our individual zone's upper limits. Even social groupings can affect learning progress; some individuals feel stress in groups; some react differently when mates or friends are nearby, or with a person of opposite gender or different age. And of course physical distress due to harsh winter elements, altitude, excessive springtime heat, or getting tired should be addressed before they block progress. For first-time skiers, learning to slide and then to turn and to stop are the first goals; then they break through to parallel skiing, and finally become mountain masters. On the journey, students learn how to explore all degrees of slope from green (easier) through blue (intermediate) to black (advanced), adding skiing on groomed, icy, bumpy, or powdery slopes as conditions and advancing skill levels allow. Mastery of technique may be an end in itself, but is also a means to the end of skiing more of the mountain with more control and therefore more fun. Tactical strategies are also explored; that is, what techniques, methods, maneuvers, and modifications of technique might work best in certain situations--like getting down a hill too steep or too bumpy for turning with one's current skill pool. For upper level students, running gates may be an option, and the discipline required to do that leads to more consistent practice by requiring turns at certain points and in certain ways, rather than allowing random choices. On-hill video analysis can also be arranged in advance, weather permitting. A manual of Bill's ideas for skiing, Skiing is a Sliding Sport, is part of this SkiMyBest website. 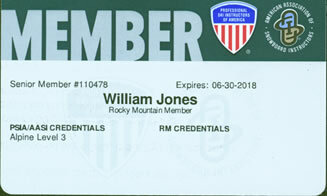 Click on How To Reserve a Private Ski Lesson with Bill Jones to reserve private alpine ski llessons with Bill Jones at standard resort prices at your choice of Colorado ski area at Breckenridge, Keystone, Vail, Beaver Creek/Arrowhead. or e-mail Bill Jones or send a letter: Bill Jones, 637 Blue Ridge Road, Silverthorne, CO 80498. This "Bill Jones, Ski Instructor" page last modified 11/03/2017 07:21:36 AM. Did you come here from a link on another website? For latest version of this page, copy to your browser: http://www.SkiMyBest.com/skibill.htm. Copyright © 2013, 2014, 2015, 2016, 2017, 2018, 2019.. William R Jones.